Purchasing this item will earn you 79 reward points (Loyalty points $0.79) ! 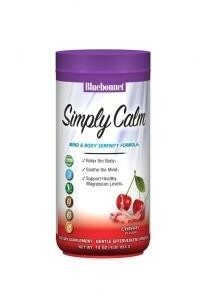 Bluebonnet's Simply Calm Cherry Flavor Powder is a special, water-soluble blend of magnesium carbonate/citrate for occasional sleeplessness, stress, as well as bone and immune support. Bluebonnet's Simply Calm Cherry Flavor Powder is a special, water-soluble blend of magnesium carbonate/citrate for occasional sleeplessness, stress, as well as bone and immune support. Magnesium is an essential mineral required in over 300 biochemical reactions in the body and known for its ability to help the mind and body ease into a state of calm...simply. Other Ingredients: Citric acid [and for flavored powders only: organic natural flavors and organic stevia extract (Reb A)]. Also free of yeast, gluten, barley, rice (unflavored & cherry flavor only), sodium and sugar. WARNING:For adults only. May cause drowsiness. Do not operate a vehicle or heavy machinery following consumption. Do not use in conjunction with alcoholic beverages. Consult a healthcare practitioner if pregnant/nursing, or if you have a medical condition, particularly kidney problems or an obstructed bowel, or currently on sleep aids or laxatives. Allergen Warning: Manufactured in a facility that process products containing milk, eggs, soybeans, wheat, shellfish, fish oil, tree nuts and peanut flavor.